These top 10 strange holes are geographical phenomena and most astounding sites in the world. Some hole are made occasionally by nature but some by the man in search for the mining wealth. Here we point out the top ten biggest and strangest of them. In the heart of the Karakum desert of Turkmenistan the Darvaza Gas Crater or The Burning Gates give off a glow that can be seen from miles away during the dark night. The large crater is a result of a Soviet gas exploration accident in the 1950’s. It was created when a Soviet drilling rig was drilling for natural gas fell into an underground cavern resulting in a crater which today measures roughly 60 meters in diameter and 20 meters deep. The huge crater was set alight shortly after being discovered and has been burning ever since. The smell of burning sulfur can be detected from a distance and becomes quite strong as you near the hot edge of the crater. The Kimberley Diamond Mine (also known as the Big Hole) holds the (disputed) title of being the largest hand-dug hole in the world. From 1866 to 1914 50,000 miners dug the hole with picks and shovels, yielding 2,722 kg of diamonds. Attempts are being made to have it registered as a world heritage site. The Big Hole has a surface of 17 hectares (42 acres) and is 463 metres wide. It was excavated to a depth of 240 m, but then partially infilled with debris reducing its depth to about 215 m; since then it has accumulated water to a depth of 40 m leaving 175 m visible. Beneath the surface, the Kimberly Mine underneath the Big Hole was mined to a depth of 1097 metres. A popular local myth claims that it is the largest hand-dug hole on the world, however Jagersfontein Mine appears to hold that record. Monticello Dam is a dam in Napa County, California, constructed between 1953 and 1957. The dam is a medium concrete-arch dam with a structural height of 304 ft (93 m) and a crest length of 1,023 ft (312 m). It contains 326,000 cubic yards (249,000 m³) of concrete. The dam impounds Putah Creek to form Lake Berryessa, the second-largest lake in California. The capacity of the reservoir is 1,602,000 acre·ft (1,976,000 dam³). Water from the reservoir is supplied mostly to the North Bay area of San Francisco. The dam is noted for its classic, uncontrolled spillway with a rate of 48,400 cubic feet per second (1370 m³/s) and a diameter at the lip of 87 ft (27 m). The Bingham Canyon Mine is a copper mine in the Oquirrh mountains, Utah. The mine is 0.75 mile (1.2 km) deep, 2.5 miles (4 km) wide. It is the world’s largest manmade excavation. The mine has been in production since 1906, and has resulted in the creation of a pit covering 1,900 acres (7.7 km²). 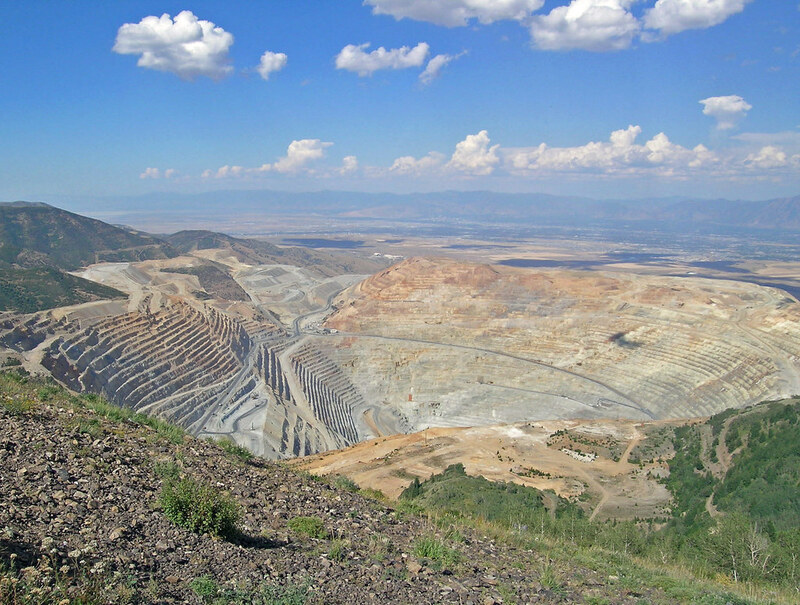 Over its life, Bingham Canyon has proven to be one of the world’s most productive mines. As of 2004, ore from the mine has yielded more than 17 million tons (15.4 Mt) of copper, 23 million ounces (715 t) of gold, 190 million ounces (5,900 t) of silver, and 850 million pounds (386 kt) of molybdenum.